the disaster still fascinates us. Titanic Norden is getting close to 1 million visitors and the interest in this website is increasing. Welcome to an exciting page. From the year 2011 Titanic Norden has been translated into English with the help of Google Translate. It was in April 1912 as the ship went on its maiden voyage. 1495 of 2207 people on board perished. This disaster was a great stir in Europe and USA, but what really happened that night? How could a ship was considered unsinkable sink? Many questions were raised about the Titanic and even today the disaster fascinates us. There is often coming a new Titanic movie or documentary and the books written about the Titanic can be counted in thousands. In the years 2000-2001, when I was in my last year of high school, I made Titanic Norden as a "project". On 1st of May 2001 Titanic Norden was up on the Internet for the first time. The website quickly became popular and the response from visitors so positive that I have continued to update and improve the site for eleven years. The question is whether the Titanic Norden will ever be finished when there is so much to write about. The aim of Titanic Norden have come to be to gather all the Titanic Facts and all the Scandinavians who are interested in Titanic one place. From 2011 I have also tried to translate the website into English with the help of Google Translate. By doing this I hope to get foreign visitors to find the website. The project has also gone on to also act on other ships. Peoples interest in the Titanic is still so large that the page has about 600 visitors a day. Titanic Norden over the years has come to be involved both in newspapers and on television. 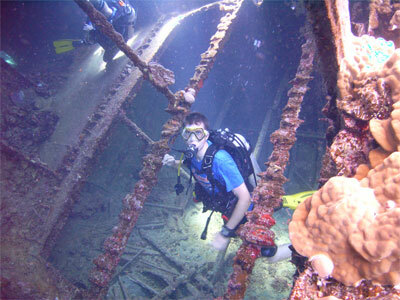 Me inside a wreck in the Red Sea. As long as the visitors continue to enjoy the website, I will continue updating it and now I also get help from many people. The layout of Titanic Norden has always looked the same. As a librarian, I advocate a simple layout where it is easy to find what you want. For my own part, my interest in Titanic now come to move to an interest in wreck diving. However, this will never mean that I abandon Titanic Norden. Apart from the Titanic, you can now also read about other ships like Lusitania, Olympic, Britannic, Estonia, Queen Mary 1 and 2, Empress of Ireland, Jan Hevelius, Mauretania, Andrea Doria, The warship Vasa and others. You can make quizzes, discuss on the forum, read about the wreck to see pictures and video clips. Here are facts about the Titanic movie by James Cameron and the actors Kate Winslet and Leonardo DiCaprio. The purpose of this site is to write about the Titanic from all sides and angles. It is not only thanks to the movie - the story of the sinking of the Titanic has captivated people for nearly a century. This is an excellent site if you are interested in this drama - in addition to depictions of what actually happened there are quizzes, a forum and lots of pictures and clips on both TITANIC as of the accident brothers Lusitania, OLYMPIC and ESTONIA. Painting © Ken Marschall. Published by permission. Read all about the ship that this website focuses on. Britannic was one of Titanic's two sister ships. The vessel was identical to the Titanic in appearance, but was converted to a hospital ship during World War I. Britannic sunk during the war and is currently in the Mediterranean Sea as one of the largest wrecks. The wreck is also very well preserved. 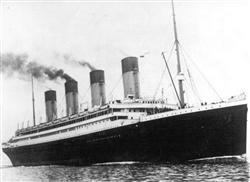 Olympic was the Titanic's second sister ship identical to the Titanic in appearance. Olympic is not as famous as her sister Because she never sank. Olympic was launched only one year before the Titanic and was used until 1935 When she was dismantled. Lusitania was built by competitors to the shipping company that built the Titanic. She was very much like the Titanic, but 30 meters shorter. Lusitania was sunk by a torpedo in 1915 during the First World War and more than 1,000 people died in the disaster. Mauretania was Lusitania's sister ship. They were virtually identical except that the Mauretania was three meters longer. Lusitania sunk in 1915, but her sister ship remained until 1935. Mauretania is mainly known for having been awarded the Atlantic blue ribbons for a total of 26 years. Estonia is Scandinavia's own tragic equivalent of the Titanic disaster. 852 people went down with the ship in 1994. 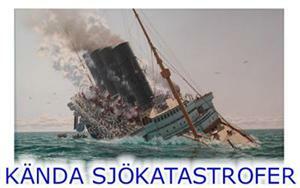 On Titanic Norden you can read new theories about why the Estonia sank and information about Jutta Rabes Estonia Film. The warship Vasa is the world's best-preserved ship from the 17th century. Read all about the Vasa period and why the ship sank on its maiden voyage about 300 years before the Titanic. You can also see pictures from the very well preserved and salvaged wreck that we Swedes are so proud of. Nomadic was Titanic's tugboat. At Titanic's maiden voyage, she came to bring passengers from the shore out to the famous ship. Today she is the last ship of the Titanic shipping company White Star Line which still exist. She was for a long time used as a restaurant in the River Seine in Paris near the Eiffel Tower, but now she is being converted into a museum in Belfast. Empress of Ireland is a maritime disaster that has been forgotten when she came to be sidelined after the Titanic disaster. The ship collided with a Norwegian ship in heavy fog and sank. Empress of Ireland took over 1000 people in depth. The Italian liner Andrea Doria collided with the Swedish ship Stockholm MS for about 50 years ago. Stockholm survived, but Andrea Doria sank. Andrea Doria was one of the largest and most luxurious ship before she sank in 1956. Jan Hevelius was a Swedish ferry that sank in 1993. Read all about the unlucky ship and see pictures of the wreck. You can also see pictures that my grandfather took of the ship in 1982 when she capsized in the port of Ystad. Queen Mary is the only one of the old ocean liners that still exist today. She is now permanently anchored in the United States and serves as a museum and hotel. I myself had the pleasure to visit her in 2008. A visit on Queen Mary is today as close as a visit on the Titanic you can get since the ships looked very similar. In 2004 Queen Mary 2 was launched, which came to be nearly one hundred meters longer than the Titanic was. She was for some time the largest passenger ship ever built and the launch in early 2004 was a great event. In 2010 I got to see her in Sweden. The Ocean liner Normandie was a beautiful and fast ship beating speed records across the Atlantic already on its maiden voyage. During World War II, she happened unfortunately out of a disaster when she caught fire and ended up as wreckage in New York harbor. In December 2011 I made three dives on the Thistlegorm which is considered one of the world's best wreck dive. Thistlegorm was carrying war material during World War II and is now lying in Red Sea as a submerged museum of World War II.